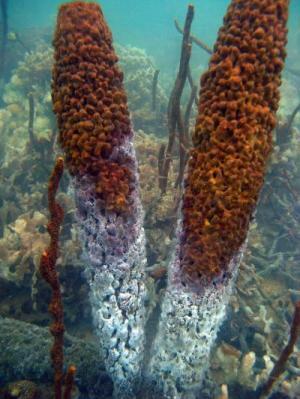 ScienceDaily (Oct. 13, 2010) — The Smithsonian Tropical Research Institute’s Bocas del Toro Research Station and Galeta Point Marine Laboratory are reporting an anomalous sea temperature rise and a major coral bleaching event in the western Caribbean. Although the U.S. National Oceanic and Atmospheric Administration (NOAA) issued an advisory in July announcing above-average sea surface temperatures in the wider Caribbean region, there had been no clear indication of increased sea temperatures in Panama and the western Caribbean until late August-early September. Scientists and local dive operators first noticed coral bleaching in the waters surrounding Isla Colon in Panama’s Bocas del Toro province in July. Smithsonian staff scientist Nancy Knowlton and colleagues documented an extensive bleaching event in late September. Station personnel recorded an extreme sea water temperature of 32 degrees C. Normal temperatures at this time of year are closer to 28 degrees C. This warming event currently affects the entire Caribbean coast of Panama from Kuna-Yala to Bocas del Toro and has also been reported at sites in Costa Rica. The final outcome of this event is uncertain. A similar event in 2005 in the wider Caribbean included intense bleaching in Panama. However, mortality was less that 12 percent in this zone and reefs have been relatively resilient. In Guzman’s opinion, hurricane season may be enhancing the current problem, resulting in low water circulation in the Southwestern Caribbean and thus creating a “warm pocket” of water along the coasts of Panama and Costa Rica.